Home » Welcome to Sealed with a Kiss! 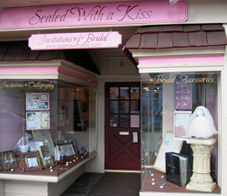 Welcome to Sealed with a Kiss! We are the original Sealed with a Kiss since 1997! Please explore our site and see all of the great items we have to offer. We invite you to visit us in-store, in beautiful Haddonfield, NJ for a relaxed shopping experience!